This unique Indian Teak incense burner box is hinged in two places making it very versatile. The top acts as a bamboo stick holder, plus a wire burner for non bamboo (such as Tibetan incense), second level is an ash catcher and cone burner area and the bottom acts a storage box for sticks or cones. 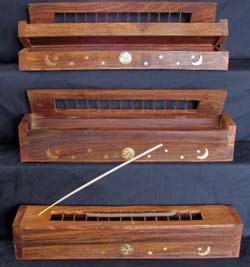 The box measures 2.25 x 2.25 x 12 and has a brass sun, moon and stars inlay. This is a favorite, it works on almost every type of incense!